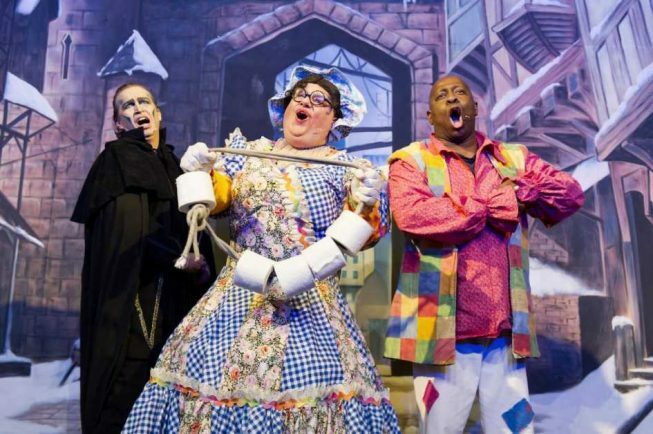 Henchman Herman, Dame Dolly and Muddles (Paul Winterford, Andre Vincent, and Dave Benson Phillips) do their 12 Days of Christmas routine. JUST when you think the panto at the Palace can’t get any better, along comes this terrific production of Snow White. It sparkles, it shines and has a glittering finale that sends the audience home with joy in their hearts. It’s a hit not only from beginning to end, but across the board too, the sets, the music, the design, it’s all spot on. On stage, everyone from the big name stars – Dave Benson Phillips, Nicole Faraday and Jai McDowall – to the youngest dancers really pull out all the stops. The songs – and the singing – are also great, and take a bow Nicole Faraday – what a voice! We all know the story, told with a suitably Redditch twist, as Prince Benedict (McDowall) sets out to win the hand of Naomi Slater’s Snow White, but not if the evil Queen Grizelda (Faraday hamming it up brilliantly) can get her mitts on him first. Cue two hours of mayhem and madness that has Benson Phillips excelling as the clown Muddles helped by his mum Dame Dolly Dumpling (Andre Vincent). It’s laughter all the way and their 12 Days of Christmas routine with Henchman Herman (Paul Winterford) is an absolute hoot. Hats off to the dancers and choreography too with Forest Fairy (Olivia Bailey) performing beautiful pointe work – outstanding. In all it’s a great production and judging by the noise the audience made, I wasn’t alone in thinking that. Just one thing, it would have been nice to see the pantomime children’s faces as they took their bow, as they too were terrific, although in terms of the production there’s a good reason for that. Snow White continues at the Palace Theatre in Redditch until December 31.